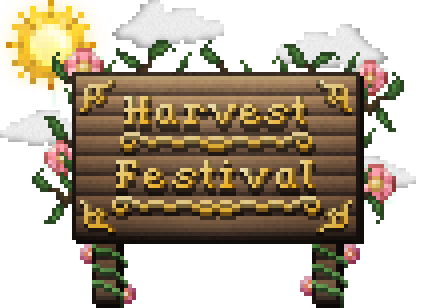 Harvest Festival is a mod heavily inspired by the Harvest Moon series of games. Adding crops and animals, that need to be cared for in order to make the most out of them. Village and relationship building with the introduction of new NPCs and the builder, who will help you build a town for the people, as well as guide you on your way. Seasons that affect day length and daily weather are also included. Cook dishes with crops that you have harvested or gather minerals in the Mine! "Can I use this in my modpack?" Of course. It would be silly to not allow it! "How do I install this mod?" Either you use the Curse Launcher and search for this mod in the Profile Creation or download this mod and put it in an instance of yours alongside of Forge (latest forge, not recommended forge!!). "Help, my game is crashing!" Make sure to check you are on the latest version of the mod since the bug may have been fixed. Also Java 8 is required! Regardless make sure to post your issue on Github provided in Support. "Is this mod compatible with X mod?" Only through playtesting we can see which mods are compatible in some aspects and which are not (e.g. Season mods). If there are any incompabilities or issues, make sure to report them on Github so the mod can run as smooth alongside of other mods as possible! "I want to help with textures/code/etc!" If you do, please make an issue on Github before so you don't create something we won't merge in or so that you don't make something that has already been done. "Does the mod do anything to vanilla game?" - Vanilla seeds being useless = Use the mods seeds! - Water not making farmland wet = Use your watering can! "Will you make a 1.7.10 version of this mod?" Sorry, but I won't. Since 1.7.10 many-many things changed in Minecraft, so I would have to rewrite the whole code which already needs most of my time. Still, it's open source, so you can give it a try. Make sure to report bugs, issues or any suggestions that you have that will further improve and fix the mod, especially mod compability! Also make sure you are on the latest version, if you can. Hop on Discord if you wanna chat with us or just ask some simple questions or tweet us! just a bug/uncompleted area. when you get 4 hearts from jade and she gives you the jam recipes, all it says is harvest_festival:quest_jam.txt (something like that). There is absolute no developement for this mod. I'm sorry. Can I use the assets of this mod in my own mod? Oops… shouldn’t have said that! I guess I am, as this is licensed under MIT! Everybody stop asking for 1.12.2 as they have clearly stated that this mod has been abandoned! Make it for 1.12.2 pleas. Wow can someone port this to 1.12.2, since they abandoned this??? This mod would be a complete gaming experience, but it's discontinued. I don't get the start book that DanTDM gets. how do I get it? It's the modpack. The Enchiridion (hope I spelled it right) mod gives it. Wow. Look at the coins ya got. I want to disable the general store.....how can I do that?